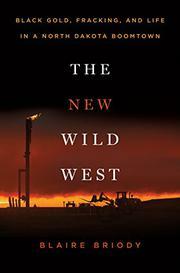 In this deeply reported debut, journalist Briody, a former senior editor at the Fiscal Times, tells the stories of roughnecks and other blue-collar workers attracted to high-paying jobs in the oil fields of Williston, North Dakota, a former “sleepy prairie town” where life has been upended by fracking. Most are young men, often refugees from the construction industry collapse. “When he ran out of money and heard about the oil boom, he decided to give it a try,” the author writes about one worker. They come by the thousands, tripling the population, making housing scarce, and taxing police and other services. In 2013, the author became intrigued by the boom and left her Brooklyn apartment to investigate. Staying for months at a time and getting close to many workers, she soon learned that abundant job opportunities exist in Williston alongside bleak living conditions, homelessness, drunkenness, crime, and more. Sadness and uncertainty pervade the new version of the town. “The only thing that’s out here are jobs. That’s it,” said Tom Stakes, an ex-preacher who arrived with $20, drank too much, and left with $1,000. Often divorced and remarried, Cindy Marchello offers the vantage of a hard-bitten woman determined to improve herself but struggling to keep up in the hazardous fields (“I will never be tough enough for this job”) and wary of her fellow workers (85 percent men): “If you smile at them, they think you’ll spread your legs.” The narrative’s accretion of detail is often overwhelming—e.g., in repetitious, fact-packed sections on a pastor’s sheltering of homeless workers in his church—but sometimes highly revealing, as in a lingering image of a trailer smelling like “cigarettes, dust, booze, and stale A/C air.” Stronger editing would have helped, but the book contains solid explanations of shale oil extraction, the lack of government regulation, and the ruinous environmental impacts. An unvarnished, overlong account of the facts behind America’s newfound oil dominance.